Run flat tires have become extremely popular recently. Part of this is due to the peace of mind they offer drivers. However, many run flat tires have been discounted because they are thinner than the average tire. This can lead to a much bumpier ride, which makes people hesitant to buy them. With that said, many manufacturers are coming out with new run flat tires that offer improved performance thereby leading to a smoother ride. If you are considering buying some, here are the ten best run flat tires. 1. One of the best brands you can buy is Bridgestone. Bridgestone run flat tires use improved technology like the NanoPro-Tech Sidewall, a rubber compound built into the tire’s sidewall. The best model that uses this technology well is their RE960AS Pole Position RFT. 2. 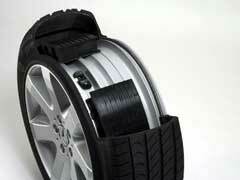 The Pilot Sport PS2 ZP, is an excellent tire made by Bridgestone. The tires feature a Variable Contact Patch that helps keep more of the tire on the road during turns. This leads to better control and ride quality for drivers. 3. One of the best set of run flat tires to buy is the Yokohama ADVAN Sport ZPS. The grooves provide superior traction on wet surfaces giving the rider more control in bad weather. 4. Continental run flat tires are durable. One of their top models is the Continental ContiSportContract 3 SSR, which features zero tire pressure driving for speeds of up to 50 mph for 50 miles. 5. The Pirelli PZero RFT features the best in innovation and control for drivers. The pairing high grips are perfect for any surface condition and you’ll love the durability this tire offers as it can go on zero pressure for up to 50 miles. 6. Dunlop run flat tires are affordable and have many good features. The Dunlop SP Winter Sport M3 235/45-18 XL Tire gives drivers superior versatility. These performance tires can go on several different car types and have great road performance on both dry and snowy surfaces. 7. If you live in a colder climate, the Bridgestone Blizzak LM-25 RFT is the perfect tire for you. They have outstanding styling, which will go well with your sportier sedans and roadsters. Further, the tires have a directional tread design that reduces sliding on wet or slick surfaces. 8. The Kumho ECSTA SPT XRP Run Flat Tires 225/45/12 91Z BSW provides riders a smooth ride. They accomplish this by the footprint shape of the tire along with the triple thread radius, which provides even distribution thereby giving drivers a polished feel. 9. For crossover or SUV vehicles, the Michelin Latitude Tour HP Run Flat is the perfect choice for you. One of the tires best features is the Secure Lock Tread Blocks, which remain open during normal driving for superior traction. They also offer drivers excellent handling and control as the blocks close under stress. 10. Lastly, the Goodyear Eagle RS-A EMT Run Flat is the perfect blend of durability and comfort. The tread design gives drivers the best in traction whereas the Advanced EMT technology allows you to continue to drive when there’s no tire pressure.